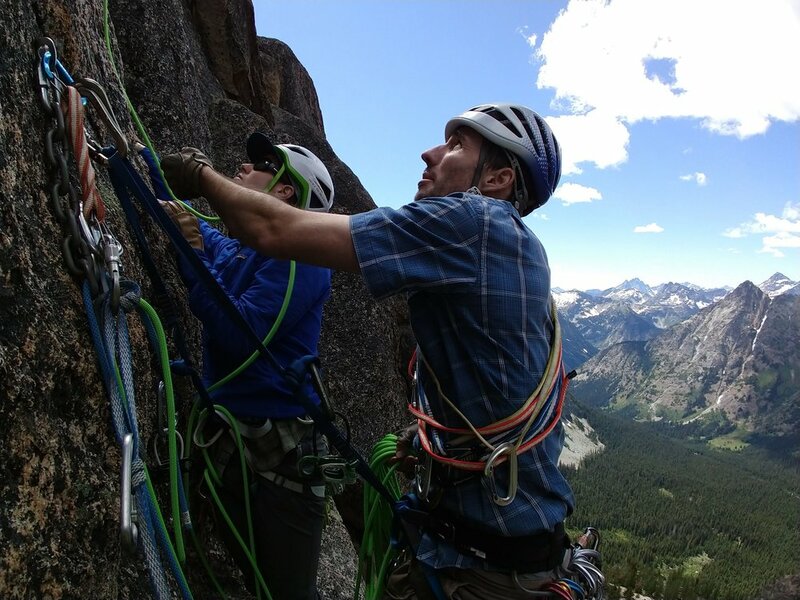 In mid-July, three 5.8 Alpine Mountain Fun Institute climbers invaded the north Cascades in Washington, looking to tick an alpine rock route and summit Mt. Shuksan on consecutive weekend days. Because we sponsor ourselves, our weeks are spent working hard indoors, and we ply our alpine trade during the all-too-short weekend. Being a weekend warrior is what the 5.8 AMFI is all about, thusly we embrace Friday afternoon traffic, trailhead bivouacs, instant coffee, overstuffed roof boxes, and high-sodium canned or bagged food. In addition, the 5.8 AMFI code of conduct prohibits complaining about other parties on a trail or route, as well as any other talk of overcrowding; because, by our being there, we are part of the same “problem”. How hypocritical of us to bemoan crowds on a beautiful Saturday in one of the most glorious mountain ranges in the world! This trip to the north Cascades started Friday morning in Bend, making last-minute errands to the grocery store, before starting the drive to Seattle to pick up Kyle and Zach. I left town at 10am, drove to Madras, got gas, and decided to take highway 97 towards Maupin instead of 26 over Mt. Hood pass towards Portland. This route seemed to take a long time, running into road construction, and slow going through southern Washington due to the curvy road and high winds. Once I hit interstate 90 in Ellensburg, it was time for gas and a short break before the final push to Seattle. Arriving at a filling station, I was parked in such an orientation that when I opened the driver side door, the wind caught and smashed it into a conveniently placed bollard, rendering a large dent in Karen. Sad! The drive over Snoqualimie pass was uneventful and I arrived at Kyle’s house at 5pm. He got back from work a short time later, we grabbed some take-away chicken teriyaki, repacked Karen, and jetted off to scoop up Zach at 7pm. We drove north to Montlake, found Zach eagerly waiting outside his apartment building with several large bags of gear. A quick Karen reorganization followed, and pretty soon the three of us were on I-5 north to Burlington. It took about 3 hours to reach our starting point for Mt. Shuksan, darkness fully falling as we pulled in, oriented the car for maximum sleeping comfort, and did a brief gear sorting session in preparation for an early start Saturday. Several other parties were sleeping outside their vehicles and we tried to be quiet despite the tinkling of metal crampons, ice tools, and carabiners. Kyle and I slept in Karen, as per usual, and Zach slept outside in his bivy sack. Our alarm was set for 3:45am, with a goal departure of 4:30-5:00am, anticipating a 12-14 hour day in the mountains. When the alarm finally jingled I extracted myself from Karen, quickly packed my rucksack, watched another group set off right around 4am, and waited for water to boil for coffee and oats. We did a good job efficiently readying ourselves, as befits seasoned 5.8 AMFI members, starting up the densely forested trail at 4:45am. A headlamp was just necessary to avoid stepping on a root or rock, and as my right ankle was still a bit tender from my misadventure on Mt. Thielsen in June, I was content to take it slow and steady until the sun fully illuminated the trail. 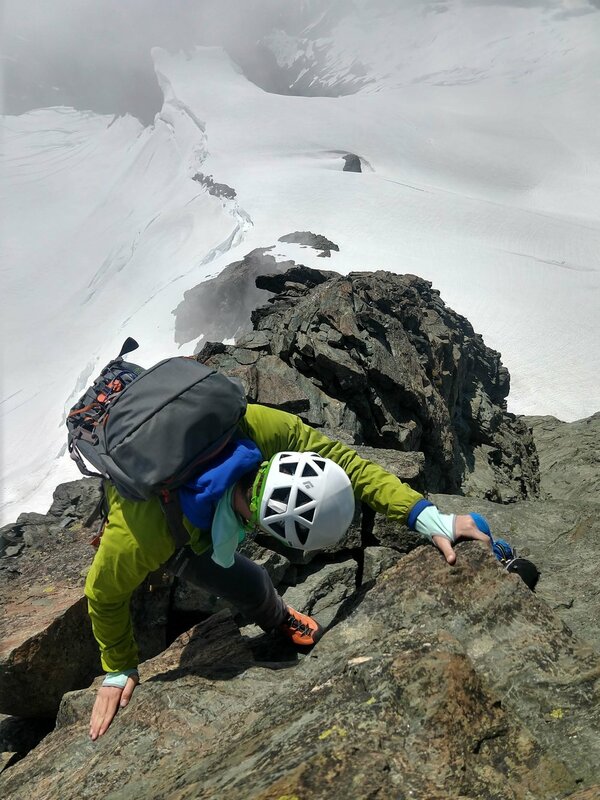 Our gear for this peak included 3 snow pickets, standard glacier travel hardware, crampons, a straight shaft piolet, 3 liters of water each, a 50 meter 8.5mm rope, plenty of food, sunscreen, and extra layers. We also chose to wear trail running shoes until reaching the Sulphide Glacier, so we had 3-season mountaineering boots strapped to our packs as well. This proved to be an excellent decision 10+ hours later, as having comfy shoes for the final few miles was a great treat and quite motivating to boot (pun intended). 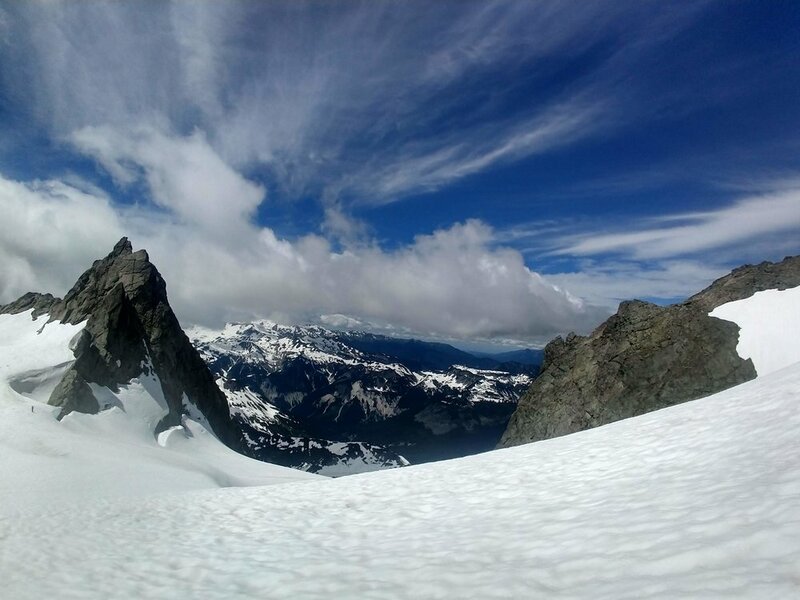 Our route up Shuksan was the Sulphide glacier approach with an ascent of the Southwest rib to the summit proper. The first 4 miles or so ticked by quickly, despite being constantly uphill through old growth forest. We passed a few fellows with skis on their packs and caught the 4am group just as we crested into the subalpine environment. Enjoying a brief period of flat trail and a short break with an excellent view of Mt. Baker, we rested and hydrated before committing to the sunny jaunt up the Sulphide. Stepping into the alpine cirque separating North Cascades National Park from the Mt. Baker National Forest was where snow travel became mandatory. Thankfully the surface was quite firm and we didn’t need boots or crampons due to the low angle of the terrain. One hour after crossing into the National Park, a large rock at the toe of the glacier proper proved to be an ideal rest and staging area for the remainder of our climb. 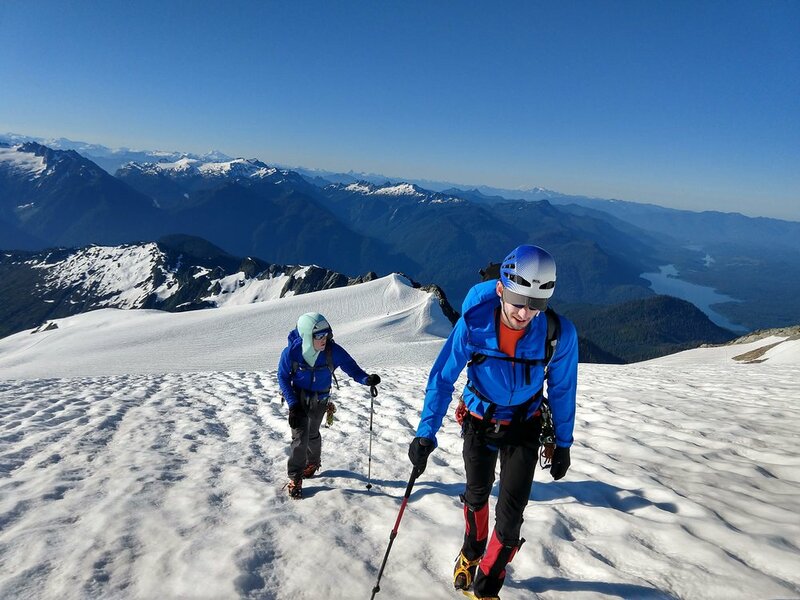 Ditching trail runners and hiking poles, donning crampons and harnesses, we looked every part eager mountain men ready for a challenge high in the north Cascades. Staying far left to avoid the jumbled maze of crevasses and an icefall to our right, we followed a few other parties just visible in the distance. On such a large glacier, perspectives are skewed, distances are extremely hard to determine, and all one can do is put one foot in front of the other and trust you’re getting close to the massive monolith of Shuksan. It seems to me the most important attribute for glacier walking is patience. It comes in handy when navigating broken or unfamiliar terrain, as rushing into a minefield of holes in the snow is quite foolhardy. Patience is also useful while walking ever further, but seemingly making no progress toward the distant goal. I suspect this is true of most hiking pursuits, but feels especially important and thought provoking up on glaciated terrain. After roping up about halfway to the summit pyramid, we arrived at the base of our chosen route at 10am, 5 hours or so after leaving the trailhead. A party of three was just launching up the blocky terrain, simul-climbing, placing minimal protection in the rock to guard against catastrophe, but mostly ensuring safety through skill and panache. A fall in this type of terrain was unlikely, but none of us were going to tempt fate and push the envelope trying to reach the summit. We got surprisingly cold waiting in a small, shady notch to begin our climb. The weather had been fickle all day, with large cloud bands moving across the sky, obscuring our view of the route up the glacier and the summit of Shuksan itself. Thankfully, by the time we started up the rock face conditions were generally good and had no problem staying on route and moving efficiently as a team of three. Passing the other party soon after starting our climb, we enjoyed excellent rock and stellar views all the way up the summit. We could hardly wipe the smiles off our faces, sitting atop such a grand promontory, feasting on cured meats, hard cheeses, apple slices with caramel dip, and Swedish candies. Signed the summit register, took a few pictures, and began the scariest part of the day: rappelling and downclimbing the 4thclass gully full of loose rock and talus back down to the Sulphide glacier. Two rappels went uneventfully, the downclimbing was a bit heads-up, but eventually we reached the relative security of snow and let out a collective exhale at being out of the path of rockfall. Roping back up for glacier travel, a couple of climbing rangers from the NPS met us for a chat and friendly reminder to get permits for any overnight camping we may be doing in the National Park. We informed him we had set off from the car that morning and were not planning on doing any camping at all. I wonder if this has been an issue here, as he did not seem to fully believe us, and reinforced that permits are free, but there is a quote. Also, it is possible we completely misread the conversation and the ranger was simply checking in on us and making sure we knew all the rules. I’m inclined to believe the latter, as I know these folks are underbudgeted and overworked and simply doing the best they can to protect the places we love to recreate in and around. Coming down the Sulphide was quite the slog, the suncups had turned from firm stairsteps into collapsible ankle-twisting hazards, slowing our descent as we tread thoughtfully down the glacier. A few short, slushy glissades cut some time off our hike, and soon we were grabbing our trail runners, refilling our water bottles from a glacial stream, pinning our ears back and making trails back to the car. We ended up going car-to-car in about 12 hours, covering 14 miles. A round of beers, snacks, and a dip in Baker Lake rounded out the afternoon and early evening. We still had a long drive to Washington Pass and wanted to be at the Blue Lake trailhead before dark. Driving on highway 20 through North Cascades National Park in the early evening proved to be very beautiful and I kept quizzing Zach and Kyle as to the names of the numerous peaks and lakes we sped past. Kyle whipped up a tasty supper near the “hairpin”, we watched the sun cast long rays of pink onto distant rock towers, and repaired to bed in the back of Karen at Blue Lake trailhead. A fitful night of sleep followed, Kyle and I kept sliding up against the hatchback as we were parked at too steep of an angle to keep us fully horizontal. In any case, we must have had some rest, because we awoke to full sunlight and a mostly quiet parking lot. The other climbers having set out long ago to spend as much daylight as possible in the alpine, we were content to have a slow morning. Our goal was to climb a single, 3-5 pitch route, something we should be able to accomplish fairly easily despite our relaxed start. Hiking toward the Liberty Bell group is a pretty mellow experience for the first few miles, something we fully enjoyed after the big day yesterday. Upon reaching a distinct climber’s trail, the gradient rises, quickly becoming a mix of loose rock and large boulders to navigate around. From this angle the individual spires are difficult to identify, and we managed to head up and around the south side of Concord instead of the north. 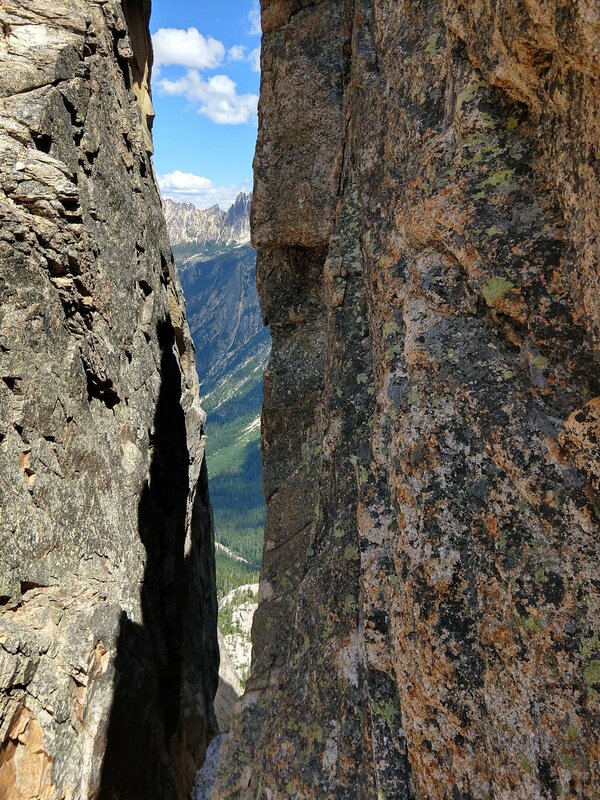 No matter, a short backtrack and scramble up a gully full of loose rock had us staring up at our goal climb. Surrounded by the sights and sounds of fellow climbers, we quickly flaked the ropes, racked up, packed a small bag full of coats, food, and water, and watched Zach lead the first pitch. As he cruised up the rock face, Kyle and I prepared to follow, staving off the shivers from standing still in the gusty, fully shaded area between Liberty Bell and Concord Tower. Once we started climbing we warmed right back up and met Zach atop pitch 1, a huge ledge with plenty of room to spread out and get comfy. Unfortunately, we managed to forget the small pack with jackets and food, so I loaned out one of the coats I was wearing to Zach while we waited for Kyle to lead the second pitch. The actual climbing was pretty easy, on solid rock, with wild views of the Cascade range abound. This is a very special place and somewhere I hope to come back to many, many times in the ensuing years. Zach finished up the leading duties on pitch number 3 and soon had us atop the tower, celebrating out second summit in as many days, hamming it up for a few photos, but ready to descend for our food and warm clothing. Three rappels got us to the bottom, happy to have double ropes to make the job a bit easier by ensuring we had plenty of cord to reach each station safely. After refueling and repacking, the descent of the loose gully proved to be quite strenuous and stressful, trying to maintain balance and not kick rocks down on each other was difficult! We encountered our second mountain goat on the way down, having already seen a mother and kid earlier in the day. This goat seemed to be seeking shade, a sensible decision on this warm afternoon. In similar fashion, I shed my jacket and reapplied sunscreen upon reaching these exposed western slopes in preparation for a warm descent toward Karen in the Blue Lake parking lot. afternoon heating up, lots to look at. Reaching the car around 4pm, a woman named Susan came up to us and offered fresh pluots from a farmstand in the nearby town of Winthrop. We greedily accepted and started chatting with Susan about this and that. She is a very friendly woman and was waiting for her significant other to return from his day out climbing in the alpine. I quickly made the decision to admit Susan into the 5.8AMFI and promised her a sticker as soon as we have them made! Susan if you’re reading this, please know I’ll get you some stickers pronto. A long drive to Seattle loomed ahead of us, but not until we went for a swim in Diablo Lake and ate a big bowl of mac n’ cheese with Hatch green chile (Kyle and I representing our New Mexican roots!). A Dirtbag Diaries podcast helped pass the time, and by 8:30pm I was dropping Zach back off at his apartment in Montlake. Kyle and I zipped down south and got home by 9pm ourselves. I think all of us were pretty spent physically but full of stoke and wonder from the hours we had just passed in the mountains. Monday morning was not far away, but all we could talk about were the endless glaciers, splitter granite cracks, alpine lakes, mosquitos, and the tasty pluots. The next morning, I took Kyle to work at the University of Washington at 8am, then hit the I-5 south, cruised to Portland, turned left at Mt. Hood, and was back in Bend by 2:30pm. Several hours of gear reorganization and cleaning followed and pretty soon it was time to get my mind around the fact I had to work Tuesday morning. Eventually all weekends and all trips come to an end and this was the end of mine. I could not have asked for a more fun and fulfilling way to spend the last 4 days and a better gang of fellows to have done it with.